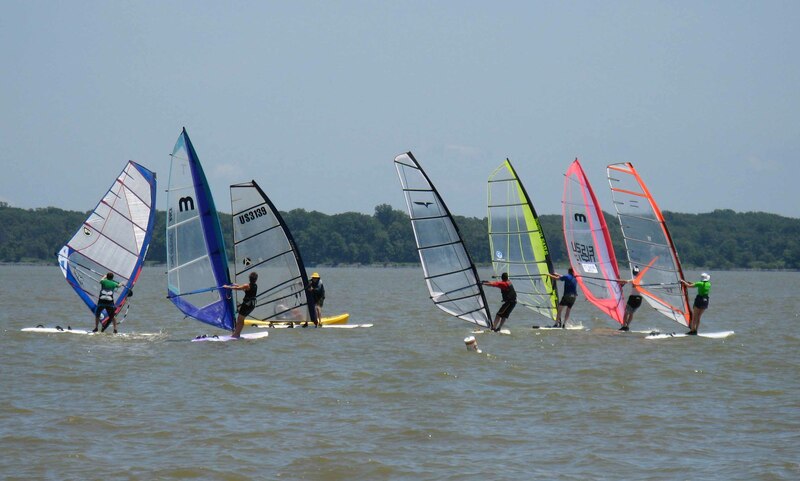 On Sunday BABA’s Learn to Windsurf took center stage with an enthusiastic group of newbies ready to get on the water. Storms were raging inland again but the bad weather was magically diverted around Gunpowder by BABA juju. Hal Ashman of Ultimate Watersports was the lead on-land instructor. I don’t think the students realized that they were being instructed by one of the East coast’s best. Thanks for being there for BABA, Hal! Winds were increasing through the afternoon so the LTW students had light wind to get started and a bit more of a push once they got their basic uphauling and sailing skills under wraps. I heard one exuberant student cry out “I CAN DO IT!” Congratulations to Janice E for continuing a tradition of well attended LTW clinics. Thanks to all the folks providing on the water coaching – Mark Windz41, Helen VG, Bill A, Coby and Dennis. Hal Ashman of Ultimate Watersports teaching the group.